Planimetric and altimetric mapping of the agricultural establishment. We use high-resolution satellite images that allow us to have an accurate knowledge about the surface usage and distribution. 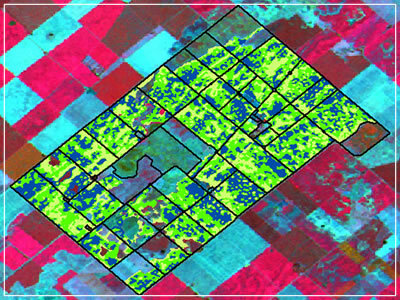 Parcels and areas available for agricultural production. Infrastructure: constructions, tanks, silos, farmyards, paths, forest areas, water streams, among others. 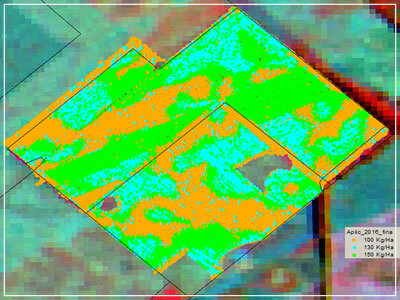 Satellite measurements offer key information for the optimization of the production system. Definition of level curves based on satellite images with which we generate topographic models of the agricultural establishments. By means of the study of historical satellite images obtained over a period of more than 20 years, we determine areas with different levels of flooding risk. 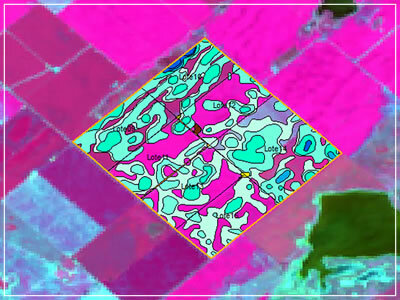 The images show the progress of water into the fields during periods of abundant rainfall. We align this map with the satellite altimetry that shows the different elevations on the field. 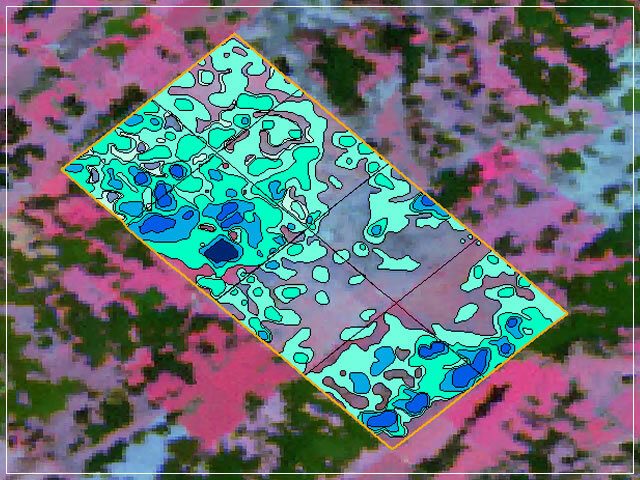 Based on the topographic models, flooding risk maps and satellite images, we analyze variability patterns and create environment maps. 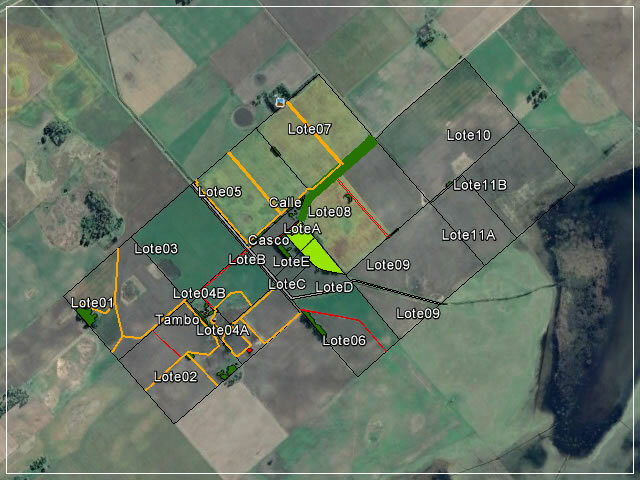 This way, we have the necessary information to make decisions about the management, for example: crops rotation, seed varieties, variable application of supplies, assignment of areas for agricultural or stockbreeding activities. We define areas with different productive potential based on green vegetation indexes and yield maps. Based on the observation and study of historical satellite images, in a sequential manner and on key dates, plus the yield maps, we can obtain a new map in which we differentiate areas according to the productive heterogeneity. This study is the base to make recommendations about supplies at variable doses. 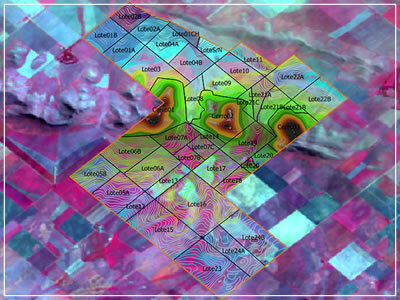 It consists of setting points in areas differentiated according to their productivity or environment. Subsequently, the field-targeted sampling is performed. Samples are shipped to agronomic laboratories and the results obtained are used to plan the doses of supplies that should be applied. 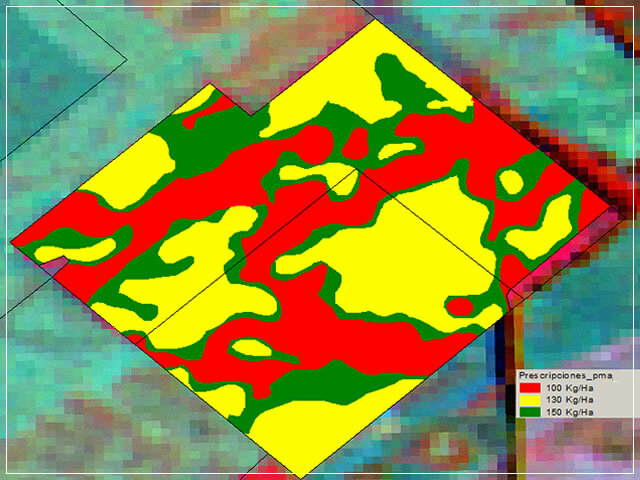 We prepare maps with supplies recommendations and applications at variable doses (VRT) for different equipment brands. 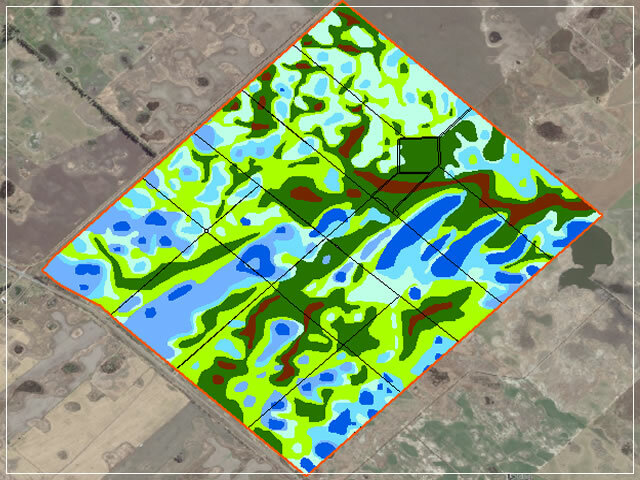 Based on the productivity or environment maps, and leveraging the soil sampling results, the agronomist or technician responsible for the production defines the supplies’ doses that should be applied in each area, according to its productive potential. 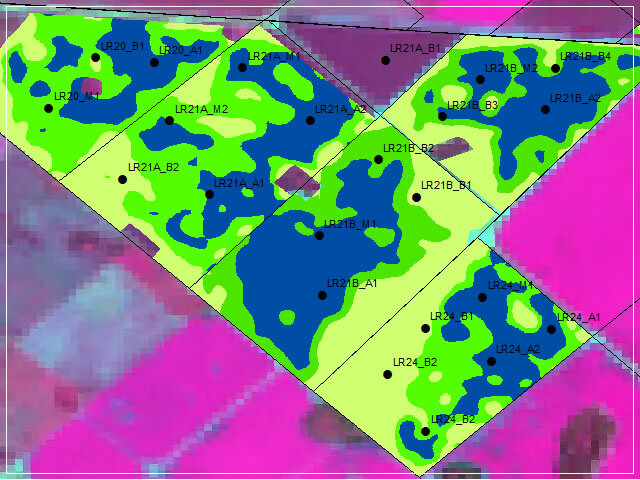 With this data, we generate the supplies’ recommendations at variable doses files that are loaded to the seeder or sprayer computer. 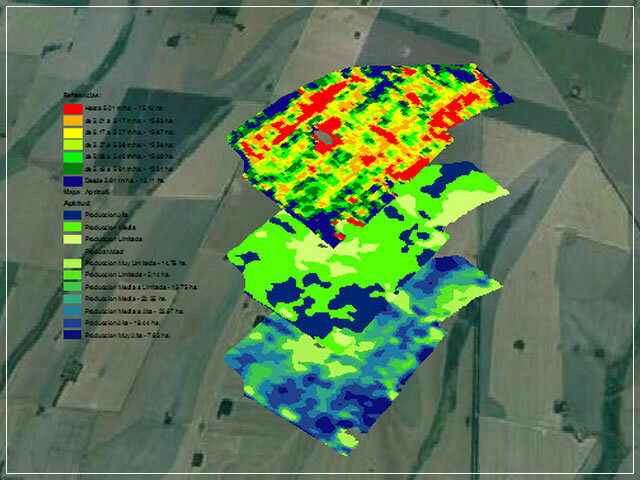 As the agricultural equipment regulates the supplies, it records data about the task done: applied amount of supply, working speed, among others. We generate yield maps based on the processing of data gathered by the grain yield or chopped material monitors. These maps are essential to outline production areas, to audit operations and to be used during the campaign´s analysis for the decision making process. They contain information about the dry yield, wet yield, crop speed, crop humidity, monitored surface, crop flow and elevation, among others. The gathering and arrangement of the geographic information generated on the campaign facilitate the creation of databases needed to analyze the performed tasks results and to make decisions with better tools and knowledge. 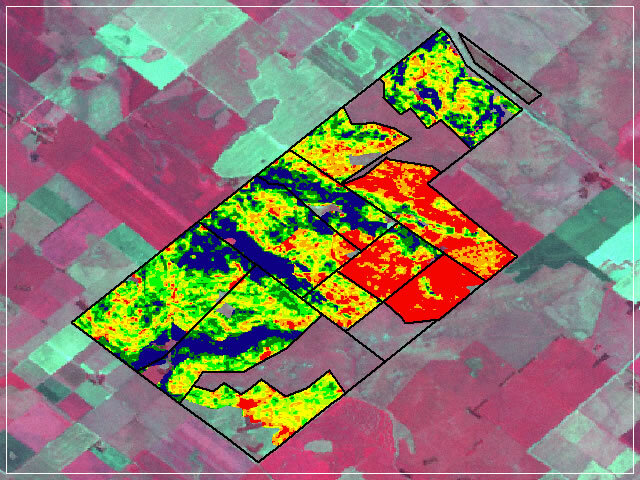 Correlation of yield per environment. Evolution of crops indexes through the campaigns. Yield according to sowing dates. Yield according to the seed variety. Yield according to the previous crop. Consists of the study of historical satellite images and geographical data available in order to have accurate information before confirming the rental or purchase of a field. How can I start? Contact us today and our consultants will clear up all your doubts.